As the CEM 900 team awoke, they were greeted by a day that was perfect for riding—sun, pleasant temperatures, and a light breeze. Jay had the grill fired up and cooked an omelet designed to fuel the riders for the morning portion of the ride. 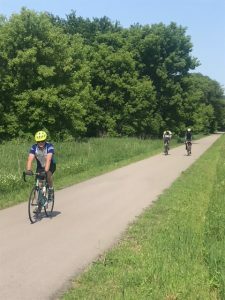 The team was riding an out-and-back from their campsite in Lanesboro to the last trailhead in Houston which is 31 miles each way. 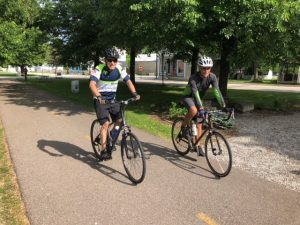 The junior riders, Johnny and Tony, were determined to accomplish something significant as they were humiliated when the senior riders out distanced them by five miles on Tuesday. The team hit the trail at 10 am riding toward Whalan, Peterson, Rushford, and finally Houston before reversing course. Jay drove the Mother Ship to Rushford loaded with food set to refuel the riders as they passed through. While all five riders were still running together a huge black bird swept up and out from the weeds flying directly in front of Jim and Bob. After much debate about the species of fowl that nearly took out our lead riders (the team deciding it must have been a bald eagle), local riders assured the team that it would have likely been a turkey buzzard. The day was spent riding along the river, mostly sheltered with a canopy of trees and lush, green undergrowth. Along the way, John spotted a blue indigo bunting, Johnny had a fawn run along beside him for a while, and Jim had the misfortune of hitting an indecisive chipmunk. The senior riders met up with a lady rider on a new electric assisted bike. All three were taken by the thought of easy pedaling up some of the pesky hills—and considered the possibilities of going partially electric on future rides. They even weighed in with the thought of having the propulsion unit concealed to prevent Dennis Hill from knowing. The lady, who rode coast-to-coast on a conventional bike four years ago, told the guys that she had just easily ridden up a steep incline they were dreading at a steady 15 mph. Later, riding on the trail, Bob yelled up to John and Jim to stop at the next shady area to stop to take time to stop for a water break. John and Jim stopped as requested, but Bob had to brake hard to miss them and wound up going down—again. Fortunately, it was only his pride that was significantly hurt. He emerged from fall number two with just a light abrasion on his left knee which appeared to balance nicely with the right knee abrasion from the day before. The senior team rolled back into camp at Lanesboro with 62 miles over their shoulders. The juniors had long been back, and were touring Lanesboro, likely creating a bit of trouble. Walking back into camp, learning the seniors had accomplished the planned 62 miles, the juniors reported that Johnny had ridden 75 miles for the day, and that Tony had done an out-and-back between Rushford and Houston, a ride that includes a significant climb, averaging 20 mph. Without question, the seniors were impressed, and were silently pleased with the knowledge that their 5-mile over-ride the day humiliated the juniors to the extent that it pushed them to a higher level of performance. 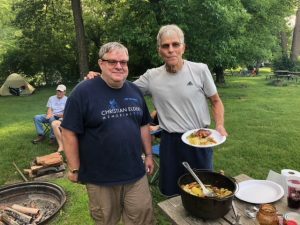 After another round of five-minute 50 cent showers, the team gathered for another of Jay’s superb dinners—barbequed chicken, with his peach bbq sauce, and Dutch Oven cooked veggies. Later, he served peach cobbler. Again last night, no one went to bed hungry. Tomorrow the CEM 900 boys will ride the final 62-mile leg of the 2018 ride. The team will ride thinking of Christian Elder, and how pleased he would be to know that for 13 years, various assembled teams have gathered to go the distance in an event named in honor of him. The team is grateful for the continuous support of the title sponsor, Merchants Bank, for the support from Single Ply Systems and Elder-Jones, and from the giving by the many individual donors. And the team is proud that in the end, the effort is made to ultimately benefit Kids n’ Kinship, an organization dedicated to making a positive difference in young peoples lives. Thursday marks the final day of CEM 900 riding this year. 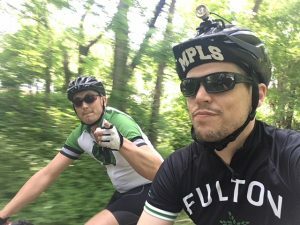 The team looks forward to another nice day pedaling along the Root River—and then to seeing friends at the CEM 900 reception on Friday at Merchants Bank in Apple Valley.